Fall is a great time of the year to apply a sealant to your wood fence. Wood fences have been a popular choice for residential properties for decades. They are a timeless option that can provide a yard with a traditional appearance. One of the benefits of wood is that it can be stained or painted any color. The downside to wood is that it does often require maintenance over the years. However, there are several things that you can do to prevent problems from arising down the line. Keep reading and discover a few tips for preventing future problems with your wood fence. Nowadays, there are all sorts of woods available for fencing. 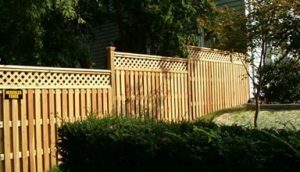 When it comes to fencing, you are best off choosing pressure-treated wood that will hold up to various weather conditions. Wood will rot if it is overexposed to moisture. If you want a fence that is going to last you several years, pressure-treated wood is your best bet. Although it is a tad more expensive, it is going to last longer. A common issue with wood fences is that do not get installed into the ground deep enough. As a result, they will become wobbly over the years and destroy the integrity of your fence. It is important to realize that mother nature is often rather unkind to fences. High winds and various forms of precipitation take their toll on them. Wood fence posts need to be at least 2 feet in the ground to prevent issues in the future. A great way to preserve the life of a wooden fence is to paint it or stain it. This will help to protect the wood itself from moisture damage. No matter what type of fence you have decided on, Hercules Fences has the expertise and equipment to construct your dream fence. Our experienced team can help meet your fencing needs, whether they are residential or commercial, for the right price. We proudly serve Albemarle County, Amelia, Ashland, Augusta, Buckingham, Caroline, Charles City, Charlottesville, Chester County, Chesterfield County, Colonial Heights, Cumberland County Dinwiddle County, Fluvanna County, and Fort Lee, Virginia, VA. Give us a call at 804-752-7992 or visit us online. To see examples of our work and keep in touch, don’t forget to follow us on Facebook, Twitter, Google+, LinkedIn, Flickr, and Pinterest. This entry was posted on Friday, November 9th, 2018 at 1:54 pm. Both comments and pings are currently closed.